Kepler is dead, long live Kepler! It would be an understatement to say that the Kepler spacecraft transformed our understanding of exoplanets, and it’s sad to see it go. Kepler made an especially big impact on our understanding of exoplanet systems with Neptune- or Earth-sized planets, especially those close in to their stars, and with periods of fewer than ~100 days. In combination with ground-based transit and radial velocity (RV) surveys, the thousands of planets we now know of make it possible to actually do population syntheses and start to understand the demographics of exoplanet systems. For example, we have learned that there is a pretty solid correlation between host star metallicity and the presence of hot Jupiter planets, which may be evidence for core-accretion models of planet formation. Strangely, systems of multiple, rocky planets appear around stars with a wide range of metallicities. Could it be that there just isn’t enough material in protoplanetary disks around metal-poor stars to feed Jovian-mass planets? Or are there severe observational biases in play? RV surveys have tended to avoid metal-poor stars, because they have fewer absorption lines to measure; maybe metal-poor stars haven’t been sampled enough? Even more curiously, systems with hot Jupiters appear to be very distinct from compact multi-planet systems: they tend not to overlap. To try to resolve some of these conundrums, the authors of today’s paper shed new light on the relation of exoplanet system type to host star metallicity. These authors used high-resolution spectra taken with the Keck HIRES, a workhorse spectrograph that has found many of its own planets over the years. By using absorption lines between 5160 and 7800 angstroms, the authors constrained the abundances of 15 different elements in the photospheres of the stars by matching the HIRES spectra with model spectra generated with the Spectroscopy Made Easy code. They then sieved planet data from the NASA Exoplanet Archive and defined three types of systems of interest (Table 1). The only overlaps between these categories were one system shared between the multi-planet and hot Jupiter category, and nine systems shared between the multi-planet and cool Jupiter systems. Fig. 1: Probability density functions of exoplanet system categories, after Gaussian kernel density estimation. The x-axis is [Fe/H], which is a logarithmic way of measuring the host star’s iron to hydrogen ratio, or metallicity. Note how both the hot and cool Jupiters tend to occur more often around stars with higher metallicities. In contrast, the occurrence of compact multi-planet systems is a weak function of metallicity except at the metal-poor end of the plot. Figure 1 in today’s paper. Objection! We can only measure stellar abundances in the stellar photosphere. What if, as stellar models suggest, heavy elements might diffuse into the interior over time? 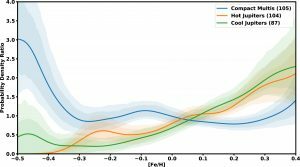 Are multi-planet host stars with metal-poor spectra just older, and not metal-poor? To check this, the authors plot the abundance of the alpha-elements silicon (Si) against Fe. If the stars really have inherently low Fe abundances, then we should expect to see a higher Si/Fe ratio. This happens because of the different timescales of two different classes of supernovae which expel different elements. (See some more of the details here.) Lo and behold, in Fig. 2 we see that the Fe-poor end of the distribution curves upward. As we can see from Fig. 1, the hot Jupiter-host star metallicity relation still stands. Interestingly, the cool Jupiters appear to correlate with their hotter compatriots. This may provide us a clue: whatever metallicity-dependent formation mechanism generates hot Jupiters may also permit the formation of Jupiter-sized planets further out. Fig. 2: Ratio of alpha-element Si to Fe, as a function of Fe. The authors note that the blank area in the upper right is probably populated with faraway Galactic thick disk stars which are less observed because they tend to be dimmer. Figure 2 in today’s paper. Another paper, published nearly simultaneous with this one, also found that giant planets tend to form around metal-rich stars. In addition, those authors concluded that the probability that planets will form in the first place may also be a function of metallicity. The fact that compact multi-planet systems can form around stars which have a range of metallicities also stands, with an interesting twist– at the lowest tested metallicities, -0.5 < Fe/H < -0.3, there appears to be a rising increase in the likelihood. Is there a glut of undiscovered multi-planet systems that lie undiscovered at still lower metallicities? 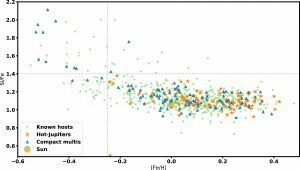 There are ancient stars in the Milky Way with metallicities of Fe/H=-3.5 and even less! Kepler didn’t have a chance to say the final word on this, and what we need now are next-generation, high-precision RV measurements of those erstwhile underappreciated metal-poor stars. Thank you for the info and wondering what the ratio is for from M dwarfs to A Dwarfs for the low metallicities, since the A to G stars would most likely be second to third generation? How much contamination of such spectra if migrating ‘Hot Jupiter’ pushed rocky / metallic inner planets into the star ? ?